This was amusing as not only did the Daily Kos obviously misunderstand the article (I doubt they properly read it), but they also probably support the only functioning system of Black Genocide in force today, namely mass abortion, which kills Blacks in the USA at a rate five times more than Whites . Oddly, they did not even bother to mention my second article. The odium that the first of these articles acquired (it still features prominently in the Wikipedia entry for “Alternative Right ” was enhanced when the decision was taken by Richard Spencer to remove both articles, while “excusing” the first of them as something heavily ironic — along the lines of Jonathan Swift’s “A Modest Proposal.” This was done, according to memory, in order not to “embarrass” a prominent anti-immigration activist, with a more mainstream approach, whom Richard was attempting to add as a contributing editor of alternativeright.com. Despite the title of the first one, both are actually about the subject of White Genocide, the first being an attempt to reframe the active and ongoing question of White Genocide by making an alternative case for genocide for another group that simply is not threatened by genocide — quite the reverse  in fact. The point made is that if there is to be genocide — and the Left seems hell-bent on arranging that for us — then why should it be Whites? 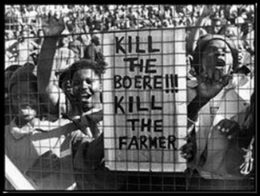 These questions are being asked and answered every day in South Africa as any visitor to the blog Boer Genocide  will attest. The blog collects and collates news stories on an unending flood of racially-motivated atrocities — a Herculean task that has to be done because no one else, least of all the Western media, is moving a muscle to do so. And it must be deeply unpleasant work too as the crimes reported are truly horrendous and disgusting. A recent and quite typical story concerned a disabled White man, Thys Henzen, 43, who was arrested on a trumped up charge, beaten by Black police, and then savagely sodomized by Black prisoners in the police cells, something that is not uncommon and which has been likened to a “war crimes pattern . 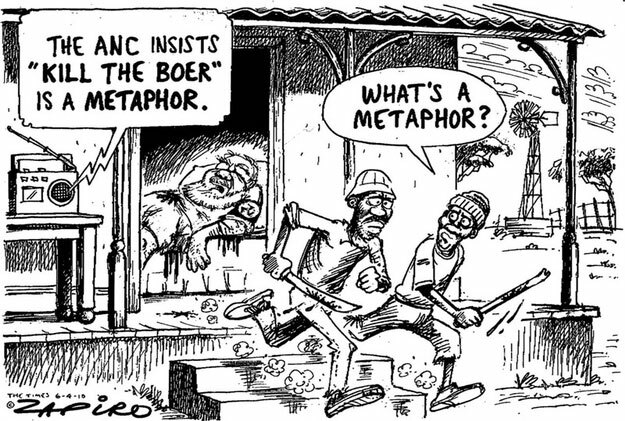 No doubt Lloyd Doksande and Fanie Msiza could have been passed off by liberal apologists as examples of the decent, modern Black South African, content to rise up in the new South Africa by his merits and labour, but that was before the two workers at a Wimpy restaurant in Kempton Park decided to murder their young White manager, Lambert Theron , 21, after he refused to let them “borrow” money from the till. This murder seeps with a savagery and genocidal hatred as so many crimes against Whites do. Once the attack commenced, the purely financial motive clearly took a back seat to sheer race hatred as the two men stabbed Theron at least 30 times, kicked in his teeth, cut off his lips, and crushed his head with a meat hammer. 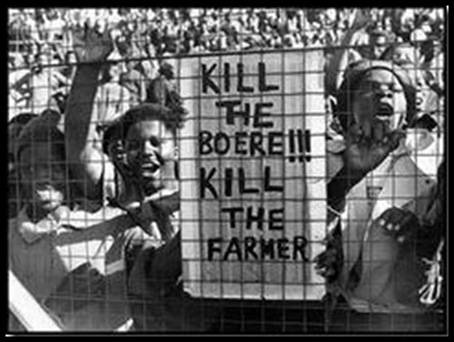 A few facts: Since the ANC took power in 1994 approximately 800,000 Whites out of a population of 5.2 million have fled the country , while in rural areas several thousand Boers have been slaughtered on their farms, often with the kind of mutilation that would be precluded by strictly economic motives. Meanwhile the government pursues measures like racist employment legislation, increasing gun control, and the raising of special militias  that have a creepily genocidal bent to them.